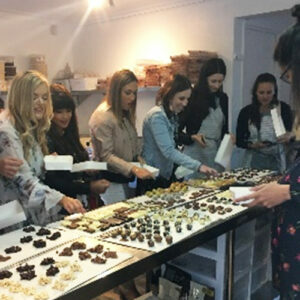 Our 4 hour Tempering and Truffle course makes a fun, informative and in-depth experience, or you can choose a shorter 2 hour course for your group where we skip some of the more technical information, and concentrate on hands on making. Hen Parties may want to use the course to make Bonbonnieres to give to gests at the wedding. Enjoy time with friends, family or colleges in this fun and playful class. Perfect for a casual and hands-on introduction to chocolate making, in a real chocolate factory. While the truffles set you can choose make some cute chocolate animals, produce some chocolate bars, or make some Rochers with a selection of delicious additional fruits and flavours. Once the chocolate sets, you’ll get to taste your creations, and box up your creations to show off at home or work. Feel free to BYO if you think it will help to get those creative juices flowing. This class is suitable for kids from approx 12 years old and up; they’ll need to be accompanied by parents / guardians.